Do you ever take your shoes off and walk on a grass lawn, a sandy beach, or wiggle your feet in the mud? If not, you might want to learn about Earthing. Earthing (also called grounding) is a new health practice that encourages people to use the earth's natural energy (the ground) to improve their health. According to earthing theory, our bodies (skin) need to touch the earth rather than only touching carpet, rubber, foam, plastic, and other synthetic materials. Earthing has only been studied about 20 years. That's not a long time when you consider other health practices such as yoga, t'ai chi or QiGong. But small studies show participants get better sleep, have less pain, reduced stress and tension, and better immune function compared to those who weren't grounded. It's easy to practice earthing; just walk barefoot outdoors whenever possible. If you can't do that, you can use grounded earthing sheets or mats to have contact with your bare skin. Our homes and offices today are filled with electronic devices, wireless connections, microwaves, fluorescent bulbs, microwaves, cell phones and cell towers, power lines, domestic wiring, and electrical appliances, which makes our bodies have a positive charge. And many of us live and work in high-rise apartments and offices. With more distance between us and the earth, our body carries an even higher charge. New research shows that the lack of electrons in our bodies may be what's causing an increase in chronic pain, inflammation and other modern health issues. The earth’s surface is negatively charged, full of free electrons we can absorb by earthing. EARTHING is the practice of touching your skin to the earth, such as grass, sand, dirt, mud, a river, lake, or ocean. Garden - Take your gardening gloves off (unless you're working with something prickly). Planting and moving the dirt around will help you earth. If the ground is smooth with no stickers, garden barefoot. You might even create a special earthing garden; somewhere to walk barefoot or even just a bench to sit on with your feet on the ground. Trees - as long as the tree is growing from the ground and not in a pot, you can use it to earth Lean against a tree, hold onto the branches or hug the trunk with your bare hands or arms. Beaches - Walk barefoot or lie directly on the sand. Walking in wet sand is even better. Grass lawns - Walk barefoot or lie in the grass (some part of your skin needs to be bare. Again, wet grass is better; I love walking in the grass early in the morning when dew is still on the ground. Clay - One person on the Earthing Forum says he keeps a small tub of real clay on hand when he can't walk barefoot outdoors. He pulls out some clay, kneading it over and over again, adding water as needed. Whether this works as an earthing method or not, it certainly would be therapeutic. If you can't find any clay from the ground, you might have a hard time finding any "real" clay to buy. I've spent some time looking at art supply companies online and all I can find are synthetic clays. Perhaps you can dig some dirt out of your yard, put it in a bucket, add water, and create mud. What Surfaces Will Ground You Properly? (I've read this book and it's quite interesting). In this video, Dr. Sinatra discusses "grounding," or "Earthing," the direct and indirect means of improving health by absorbing the earth's natural, electromagnetic energy. 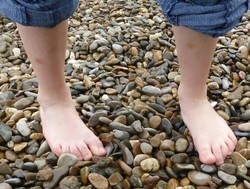 If you're not used to walking barefoot, the bottoms of your feet will be tender. You could start by setting up a folding chair and wiggle your feet in the grass or earth (pour some water on the ground for a better effect). Then try standing up and taking a few steps. If the bottoms of your feet hurt, sit back down and move your feet through the grass / earth some more. If that's boring, "march" your feet up and down while sitting still to get a little more exercise and acclimate your feet to the earth. Can Pets Benefit From Earthing? Have you ever seen dogs roll in the grass as soon as you let them outdoors? This obviously feels good and perhaps they instinctively know it's good for them. If your pet doesn't have access to grass, perhaps it could benefit from an earthing mat. People react differently to earthing; some even feeling WORSE. This may be similar to when someone detoxes. Stop earthing for a while and try again. Dr. Stephen Sinatra (prominent cardiologist) doesn't recommend earthing for patients taking the drug, Coumadin. This article explains his views on earthing (grounding). If you walk barefoot outdoors, make sure you walk in a safe environment and the ground is free of broken glass or other contaminants. Also watch out for thorns, rocks, acorns, dog feces, fire ants, scorpions, and other small stinging critters. Just because an electrical outlet has a three-prong plug doesn't automatically mean that it was properly installed. Use a circuit checker to find out if the outlet is properly grounded. Some people state that you shouldn't plug in an earthing mat into the same electrical outlet or power strip as your computer. A grounding mat or sheet needs to touch clean, bare skin. Don't apply body lotions prior to earthing. Wash your mat occasionally with mild soap and water. If your mat has a cover, you can hand or machine wash it. Don't use liquid fabric softeners or dryer sheets; you can also air dry it. Earthing doesn't last forever. For instance, when you stop exercising, you lose muscle and energy. When you stop connecting with the earth, you also lose the benefits. 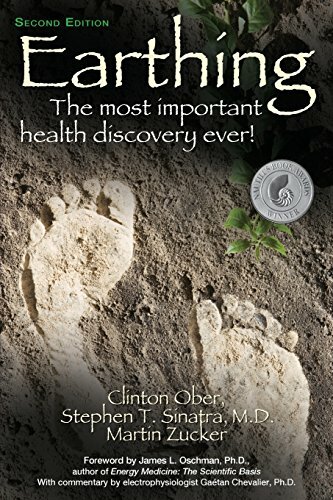 Earthing’ – Important Discovery or Mumbo-Jumbo? I walk barefoot all the time, but not in cold weather. It seems I can't tolerate cold like I used to, not since moving to south Texas 20 years ago. I have always been drawn to all things natural and the way my feet celebrates each and every comforting message from each and every different element of the earth. This is the very reason I have lived the large majority of my life barefoot. Feet truly are the receptors to life. I even enjoy walking out to the mailbox in the dead of winter, in ice and snow barefoot. Everyone thinks I am crazy BUT I know it is the best medicine, therapy and food to the soul. Great article, I love IT! Being in Britain you are never too far from the sea, so I have often walked in sand. You will find that there are different sand textures, Walking on dry dunes is an experience different from walking in wet sand. Some beaches are firm, but on others the sand is soft and yielding beneath your feet.Sand texture can change as you move along a beach. I'm fortunate that I live in a temperate part of the U.S. (south Texas) so I can go earthing almost year round. I love walking barefoot, but of course can only walk in lawns since we have fire ants, prickly weeds, etc. I do make sure I only walk on lawns that haven't been treated with chemicals. I would love to go to a beach someday and walk in sand. An interesting quote. "The world today is sick to its thin blood for lack of elemental things, for fire before the hands, for water welling from the earth, for air, for the dear earth underfoot. In my world of beach and dune these elemental presences lived...."[Henry Beston in Outermost House, quoted in Ecomysticism by Carl Von Essen.Beston was writing about his sojourn in a log cabin at Cape Cod. I have just returned from several hours gardening in lovely weather where I could tend the Earth by hand almost entirely in solitude and stop at times to enjoy the dance of the bees and butterflies. Earthing is part of the total experience of being with nature and goes alongside and in co-operation with other experiences. This sounds interesting, but I will make the point that radical therapies/practices like earthing are,if effective, challenges not only to conventional medicine/psychology but to the whole materialistic secular world-view. They show us that to understand not only the world round us but our own nature we have much thinking to do. Human nature is a mystery far beyond the nostrums of conventional philosophies and ideologues. AngelaJohnson, Thank you for the information and the product lines. Earthing is one of the activities in Shinrin-Yoku, about which I just read a book and wrote a Wizzley. I love the way cats and dogs roll around on the grass. Since reading the book and your article, I think that will be my gardening break: resting on a dappled, safe patch of grass! Jain monks in India walk bare footed. They do it as a part of non-violence, however; touching the earth is a great way to connect to our roots. I love to walk on a grass lawn and wet my feet in the beach or a shallow river. The experience is unique and I want to do it again and again. When I tend my garden, my hands touch the mud, even though the hands become quite messy, I really don't mind. For some people, it might be difficult though. You might like the ideas of the ancient Celtic church that found the sacred in nature. Chia seeds are making a comeback and being used by athletes, diabetics, dieters, and those suffering from acid reflux; as well as by people who want to have a healthy lifestyle.